First came the 2015 highs in which we indicated an ending contracting diagonal as early as February of that year, which would have started in November of 2014 and continued through May of 2015. We were looking for this structure to end a fifth wave wave up. It did. OEW called for a large third wave higher to 2,200 to 2,500. It didn't happen. Prices plummeted into August instead, agreeing with our call. Second, came the December, 2015 up wave which OEW said was almost certain to make new highs because every Primary wave before it had and that they were simply constructed (in it's view). We said, it was likely we were in a B wave up, and the B wave would likely not make a new high because of alternation with the flat wave in 2011 - 2012. Then, when OEW did not get it's new high, it called for a truncation instead, flipping around and saying the truncation wouldn't be exceeded. It later was. Wrong again. Wrong on both counts! Third, came the February 2016 low where OEW called this tune: "When this uptrend concludes, we are expecting the bear market to start making new lows during the next downtrend. Longer term we are expecting the market to lose 45% to 50% of its value during this bear market. Ending sometime in 2017 around SPX 1100." Really? 1,100? We on the other hand clearly and unequivocally wrote in the OEW forum, that the low was Primary IV and new highs were to be expected - which as you know is what occurred. We even pleaded with the author who had told us, "the universe unfolds in octaves". Our reply was, "well if the universe unfolds in octaves, then why won't you allow a Fibonacci eight-years (from 2009) for the bull market to complete?" Silence was the reply. Fourth came the latest new bull move Crude Oil call, on August 23rd, with prices at (close = 48.52) in an article called Crude and the Commodity Cycle. OEW calls for this bull market within the context of a larger bear market and says, "This suggests an upside target between $70 and $85 by the year 2020." Sounds good, right?! Wrong again. Since the article appeared Crude has declined over 10% in value and is sitting at $43.23 with new daily lows. Who makes a bull market call with a 10% decline staring you in the face, unless you clearly indicate that is the likelihood, first? But that isn't the only problem with the OEW analysis of Crude Oil. The larger problem is that OEW looks back more than 50 years to fully 1970 to begin it's wave analysis. Isn't that thorough? Ha! Anyone hear of Nelson Rockefeller? Or of Standard Oil Company? There certainly was Crude Oil trading before 1970, and lower than $1 per barrel. Crude prices in the 1930's were under $0.70 per barrel according to the EIA data. So, this whole wave analysis is woefully incomplete, and likely incorrect. In fact, the OEW analysis only really starts near the time of the first OPEC "oil shock", likely right in the "middle" of a third wave. And OEW ignores the 1990 Kuwait Invasion with prices higher by only $1 per bbl. As a signature "b" wave within a fourth wave decline, it would be a key to a successful analysis of where we are today if OEW recognized it. Fifth comes this weekend's latest OEW treatise on the disparity of the various stock indexes, which has been going on for months now. OEW has really lost it's lunch this time saying that the New York Composite Index is trading like a foreign stock index?! Really. Let's see. The DOW has 30 stocks in it's index, the S&P 500 has 502 stocks in it's index (with very little foreign content), the Russell 2000 has 2000 stocks in it's index, the NASDAQ 100 index has 107 of the largest non-financial companies that trade on the NASDAQ market place, and the Wilshire 5000 has virtually all of the stocks that actively trade in the United States. By comparison, the New York Composite Index includes over 1,900 stocks of which over 1,500 are U.S. based companies. It is very clear to even the most novice critical thinker that, because each index represents vastly different baskets of stocks, some of which trade on some exchanges, and some of which trade on other exchanges, they will trade slightly differently! Yet, the OEW claim is that the S&P500 can not be in Primary V because the New York Composite represents some foreign companies and is, itself, in Primary V. I was going to say this is the most twisted logic I've ever encountered. But it is worse than that. It's not even logic! It is words written on a page, apparently to sell a service. You'll note that this blog is not sold for a fee! We don't even ask for donations. We're not selling a course. And for a reason. Our primary aim is to be objective and see what Elliott Wave can really do for us if we let it. So, without further delay, we'll just provide this hourly chart of the S&P500 Index. SP500 A,B,C Zigzag Complete or Not? Since the truncation top, our position on the market has remained that, "risk in the market has gone up" as it now takes more points to validate a wave than when were were trading from 2165 to 2195. 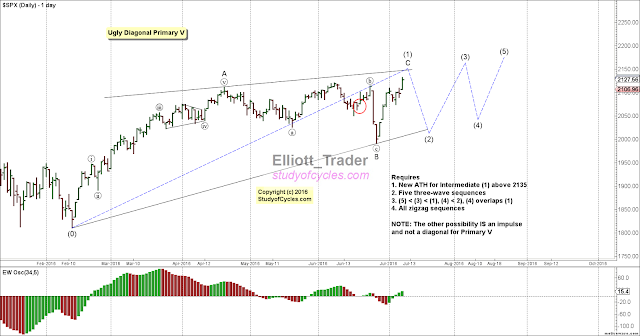 We are pretty sure the market is only making a corrective sequence lower to Intermediate Wave (2) of a diagonal wave for Primary V. As such, Intermediate Wave (2), shown here on the hourly chart, should be a pretty simple A, B, C zigzag wave, and this one is - albeit the B wave got quite complex, that is fully allowed. The only clues we really get are that 1) the upward retrace is only 61.8% and has not overlapped wave 1 down at this time; 2) the Elliott Wave Oscillator is in the correct position to indicate a fourth wave - by not traveling beyond -40% on the other side of the 3, or C location (as of yet); 3) right now, we have lower highs, but no real lower lows; 4) the B wave back at the 2187 level is so complex, it would appear to be the correct wave sequence of a zigzag, not, instead, as the second wave of an impulse lower, and, 5) remember second waves of zigzags are usually sharps, and this B wave is a FLAT wave. So, we are in the situation where the C wave may have completed, and completed with the overlap we noted in the DOW, but not in the S&P. And that would be at the low on 12 September. But it is very, very difficult to count it that way. As a result, we have discussed in live chat and yesterday in the comments of this blog, that it is possible we are forming a triangle to the downside. This potential triangle may be a "pre-FED meeting triangle", but it must, again, prove itself. Such a triangle, if it completed properly, would be the fourth wave of the C wave of the zigzag, and it would indicate "last wave down dead ahead". Right now, in the S&P 500 cash, there are enough waves and sufficient overlap to conclude a triangle has actually finished, but then a thrust down out of the triangle would be required. Yet, triangles are usually noted for taking time and moving prices sideways. And, if that's the case, there are two more ways this triangle could develop. The first way is that another wave immediately forms along the lower wave 3 barrier (putting this triangle in the class of barrier triangles). Or, further up movement could cause the triangle to expand higher one time - in an attempt to fill the gap - and form a larger (c) wave of the potential triangle., before coming back down to the barrier to form the (d) wave. Either is completely acceptable in terms of Elliott Wave logic, but it is very, very difficult to predict. That's why the old Elliott Wave maxim goes, "Trading in Triangles is Treacherous". Given that there is a FED meeting dead ahead - from a wave counting perspective - perhaps it is wise to let the market initially sort this one out! (No trading or investment advice is intended, provided or to be inferred). Anyway, from a wave counting perspective, that is our approach. 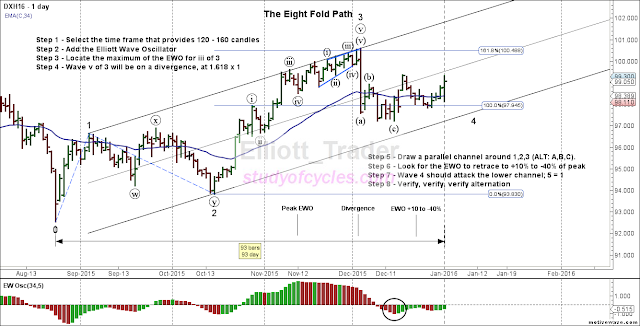 Some people not familiar with Elliott Wave work will wonder what all the fuss is about. But those of us familiar with Elliott Wave will recall that a major Elliott Wave service had predicted that the years 2007 - 2009 were the start of the equivalent of Armageddon in the financial markets. And while those years were, indeed, very bad years for financial assets, this same Elliott Wave service had predicted that this deterioration would continue in the form of a "three-wave" primary b wave higher that would eventually lead the markets lower in a new five wave sequence lower of unparalleled destruction. Today marks the day when, instead of the three-wave sequence upward, a five-wave sequence was made "instead". The chart below shows that five-wave sequence. This is of some consequence, because it is further validation of my paraphrase of the Bill Williams method of counting the Elliot Wave. This method has been detailed in the posts below entitled, "The Eight-Fold Path to Counting an Impulse Wave", and the chart above shows each one of those steps carried out without fuss and bother on the two-weekly chart of the S&P500. Why the two-weekly chart? Because the very first step is, "To chose the time-frame for which 120 - 160 candles fits 'the wave of interest'." If you are not familiar with this method, yet, you can read about it at this LINK. And companies are re-purchasing their shares with low-interest debt. Regardless of the reasons, the fundamentals are incorporated in the price changes so far, and the psychology of their application in the market is what makes the Elliott Wave above. Below is the chart of the contracting shape of Diagonal. The lengths must measure such that (5) is shorter than (3), and (3) is shorter than (1), and (4) is shorter than (2). Furthermore, wave (4) must overlap wave (1), and all the three-wave sequences 'must' be countable as zigzags - or multiple zigzags - only. We'll see how it plays out. So far, the needed high of 2135 for Intermediate (1) has not occurred, but prices got to within 5 points of that level on Friday. The THUD heard round the world! Counting the upward wave from the February lows as if it were Primary V had served us well - right up until the day of the Brexit vote. In fact, this chart of the ES E-mini S&P futures we posted the morning after the vote, shows that higher highs were made right up until the time of the vote. First, we want to note, we did not count the futures this way until 'after' the vote. Second, we want to note that the cash indexes (Dow, S&P) do not look anything like this chart - as they never made the higher high at (5) on the S&P, or at (3) and (5) on the Dow. We do note that the invalidation point of 2026 we showed on the cash chart in the weekend video has been taken out lower. During the week in two chat locations, we raised that invalidation level to 2074 because of potential overlap of another first sub-wave higher. That invalidation point was obviously also hit as the futures began their descent in the early hours. Prior to the vote, on both chat sites, we noted specifically, that "brokers were increasing margins, particularly for currencies, and that news sites stated there might even be currency halts". We also noted that Thursday's up move occurred on very low volume". Both of those factors caused us to "sit one out", and not risk capital needlessly in either direction. So where do we go from here? Well, it's certainly 'possible' that we have gotten a first wave up, and are still working on the second wave lower. Such a count would wind up synch-ing up both the ES futures and the major cash indexes. See chart below. After all, the S&P has not even made a 38% retracement of 'this' up-wave yet. So we do not wish to get too excited about a move that occurs on such wide-spread news, involving trading halts. However, it is just as possible that the market has topped with the diagonal shape on the futures. Here is the similar diagonal on the cash S&P500. The problem is this : Leading Diagonals can not fail. Well, the diagonal in the futures (which would be counted as 5:3:5:3:5) did not fail. It made the higher fifth wave. But, a similar (yet 3:3:3:3:3) diagonal in the S&P500 would have failed, and ending diagonals are allowed to fail! And, of course, since it is not possible to count the Dow Jones in the above manner, then this may provide a higher degree of probability that Primary V is still in progress but just needs a deeper second wave, as a FLAT wave. If that's the case, that would be fine with us. We can see both sides of the coin, and therefore remain "patient and flexible" until the situation clears. Again, with the momentum lower, it will not be possible to talk about higher waves until or unless there are higher daily highs that exceed Thursday's S&P high. This is a difficult wave-counting environment : one of the most difficult I have seen in recent times. And several counts remain possible. For example, it is STILL possible to see the DOW (and DOW only) in a Primary IVth triangle. And - just as we saw the S&P500 in a W-X-Y Primary 4th wave, there is nothing to suggest it couldn't continue on in Primary IV, as W-X-Y-X-Z, before making a Primary Vth wave. So, when we say something like, "Primary V may continue higher", we DO NOT mean to suggest that heavily speculative upside positions should be taken. Nor, when we say, "momentum is currently lower" do we mean heavily leveraged short positions should be taken. No, our approach is one of caution and care, and, in fact, we offer no trading or investment advice of any type. We are merely counting waves - as best we can. Here is an update to the chart presented on January 1st, 2016. As you have likely heard by now, the first week of the year was a stinker! This pretty much followed the script and count we had outlined on January 1, and we were able to call it wave-by-wave in the real time chat room. We appear to have completed minor A down of Intermediate (Y). The structure did form a valid Expanding Leading Diagonal, at least to this point. I wish I could tell you in advance how deep the minor B retracement wave will go, but unfortunately since the downward diagonal is best described as a 3:3:3:3:3 diagonal, and as an A wave, it neither necessarily calls for a deep retrace or the start of a bear market. As a B wave, it could typically be expected to retrace between 23% and 76%, of the entire diagonal but could go deeper. A retrace back to the 20-day SMA might be a good place to start. The Expanding Leading Diagonal does call for lower prices in the eventual C wave, and so, at some point we would expect the low if Intermediate wave (W) to be taken out lower. The only restriction of the valid diagonal at this point is that price may not travel above (X), and still expect minor C lower. Since there have been a lot of comments made about the curious nature of this morning’s US Dollar Index moves, I thought I would post another Eight Fold Path chart – this time not on a stock index, but on the US Dollar Index, the count of which is currently “in progress”. Again, this is the only truly ‘objective’ way I know to count the Elliott Wave impulse in real time, and to help eliminate all of the guess-work about labels. The ‘implication’ or prediction from this chart is that since wave 2 (minor 2) is a FLAT wave, then wave 4, will be something other. Wave 4 already has a clear (a), (b), (c), down in a zigzag, so it is ‘possible’ that wave 4 ended there. And while such a count is ‘possible’ and would provide the needed alternation, it does not attack the lower channel, yet, and it makes wave 4 quite short in time – which is opposite to the typical personality of fourth waves. So, it is also possible, and more likely, that minor wave 4 becomes a triangle to ‘provide more time’ for the wave to attack the lower channel boundary. Further, because wave 2 is a FLAT, there ‘should not’ be a new B wave high within wave 4. Any higher high would be minor 5. So, while the ‘potential’ impulse is playing out, there is a caveat : wave 2 is again a FLAT – which is not typical of second waves : possible but not typical. So, if the EWO breaks below -40%, or the potential fourth wave breaks the channel and does not quickly rebound, then the Elliottician must simply accept the result that 1,2,3 was actually the alternate A,B,C. The 1,2,3 and A,B,C are equivalent until they are not. Followers of my blog and in some live chat rooms will recognize that nothing in this count has been changed since it's inception, and "special note" was made when wave 3 was 1.618 x 1 - live and in real time. Cheers and enjoy the chart. A much wiser man than I called the "The Eight Fold Path" the way to enlightenment, and it is in that spirit of sharing that this post is made. When you survey the world of Elliott Wave analysis, you find that many casual wave analysts will post a chart of "something", with some numbers and letters on it and call it a wave chart, or maybe their "best guess" of where prices are going. But we contend unless people follow a very simple, eight step procedure they will be lost in making objective Elliott Wave counts: counts which are predictive - or like in fourth waves - clearly indicate when prediction is going to be sketchy, at best. So without further delay - let's outline those simple eight steps, with an example below the steps. All though I didn't explicitly say it in the first posting of this article, I need to make it clear that this method applied to counting Elliott Impulse waves only. In fact, if you follow this method, and the wave does not conform to these guidelines then most likely the wave is a diagonal or part of a larger corrective structure, and not an impulse wave! And knowing that can be a great deal of help as well. Step 1 - chose the time frame that provides 120 - 160 candles for the wave of interest. Does it have to be exactly 120 to 160 candles? No, but it should not be 80, and it should not be 220. We'll talk more about why at the end of this blog post. Notice here, we did not say, pick an hourly chart, or pick a daily chart, or pick a 5-minute chart. Elliott patterns unfold in clear waves. Your first job is to decide which wave you are analyzing. Are you analyzing the five-waves of a potential impulse third wave? Are you analyzing the A wave of a zigzag A-B-C structure? Or, are you analyzing the entire bull market wave since March, 2009? Step 2 - use a bar chart for that wave, and include on it the Elliott Wave Oscillator indicator (EWO). This indicator is also sometimes known as the Awesome Oscillator. Regardless, its just the difference of two simple moving averages; one of 34 periods and one of 5 periods. Step 3 - locate the maximum value of EWO. This location is reserved for wave iii of 3 in an impulse wave. Note the value of the EWO at this location. Step 4 - locate a 1.618 or 2.618, or (more rarely) a 4.236 extension following the first wave up. This is most likely where wave 3 in an impulse wave will end, and it will end on a divergence from the EWO value in Step 3. Step 5 - draw a parallel Elliott channel around waves 1, 2, and 3 in an impulse (which alternatively in every wave can be A, B and C). Step 6 - watch for the EWO to retrace to near the zero line for wave 4. Computer studies have shown that most wave four's will have the EWO retrace to +10% - to -40% of the maximum value of the EWO in Step 3. Further, verify, by measurement that wave four only retraces 23.6 - 50% of wave three, with 50% being an absolute maximum. Beyond, that level any wave four call has extremely low odds. Step 7 - in an impulse look for wave four to attack the lower channel line in some manner, but then rebound quickly from it - even if there is a false break. In a true impulse, Wave 5, upward, should be under way and should reach a length of 5 = 1, or alternatively, 5 = 0.618 x (net 1 - through 3). Furthermore, wave 5 must end on a further divergence with the Elliott Wave Oscillator. Step 8 - Verify, verify, verify that there was alternation present. Most second waves are deep, sharp waves. They are typically zigzags or double zigzags that retrace 50 - 62% or more of their first waves. Fourth waves are 'usually' long, complicated sideways affairs such as triangles, flats or compound waves like flat-x-zigzag. Regardless, there should be alternation in a true impulsive structure. 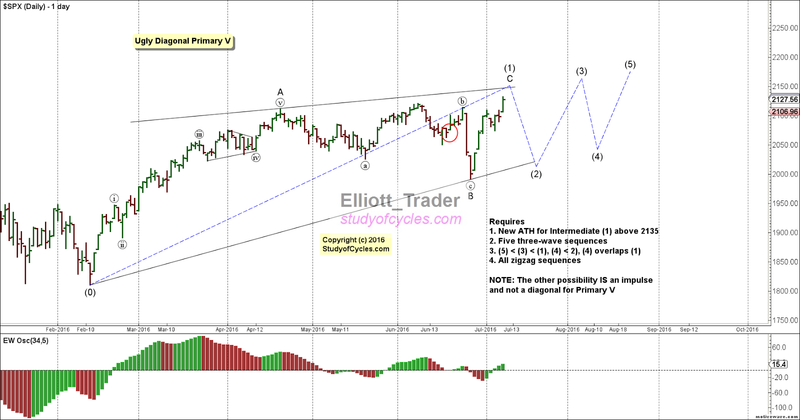 In the rare cases where wave 2 is a flat, then wave 4 will 'most likely' be a triangle or a zigzag to alternate with it. IF the potential WAVE 4 breaks the channel, and does not rebound, or the EWO takes on more than -40% of the value of wave iii of 3, on the opposite side of zero, then, most likely, the up wave was only the alternate A-B-C, and there is nothing the Elliott analyst can do except objectively accept the result. 1,2,3 and A,B,C are equivalent until they are not. This is a chart to illustrate the above concepts in counting an impulse wave - objectively. First, I decided to study the "up wave from November, 2012 in the Dow Jones Industrial Average", and selected the time frame that best put 120 to 160 candles on the chart. That time frame was "daily". 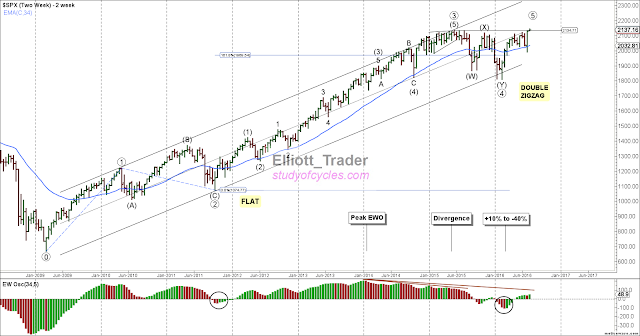 Second, the Elliott Wave Oscillator was added to the chart. 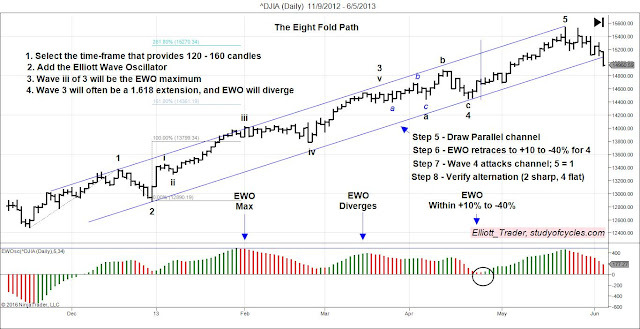 Third, the maximum of the Elliott Wave Oscillator was examined, and determined to be the location for wave iii of 3. Fourth, we note that wave 3 just exceeds a 1.618 extension. Note that wave v of 3 ends on a divergence of the Elliott Wave Oscillator. Fifth, we draw a channel around waves 1,2,3 (or alternatively A,B,C until an impulse is 'proven'). Sixth, we note that the EWO comes very close to the zero line for wave 4. Seventh, we note that wave 4 attacks the lower channel boundary, and wave 5 quickly resumes, and makes a wave which is 5 = 1, and actually, just slightly beyond. Note again that wave 5 ends on another divergence with the Elliott Wave Oscillator. Finally, and Fibonacci eighth, we verify alternation. Wave 2 is a classic zigzag sharp with a 50% retracement, and wave 4 is a 'compound' FLAT wave. Its a flat to blue 'a', then a flat to blue 'c' & black 'a', then a larger flat to black 'c', & black 4. Look at how time consuming these fourth waves are! And you know what? I almost guarantee you that no person alive predicted this exact structure. This is the very meaning of the "fourth wave conundrum" as we have presented it in our YouTube video. So, in each case you know what everyone is asking for the better part of a whole month, "What's the count? What's the count? ", and thinking, "what kind of Elliotician are you that you don't know what the count is, right now? how am I going to make money following you?! I'm getting whipped around like crazy here." And on and on it goes in those pesky fourth waves. And yes, there are even slight variations on this - such as when the first wave is the extended wave, but this is the only objective way I know to count the Elliott impulse wave. And, it was discovered by Master Trader Bill Williams, using mainframe SuperComputers to crunch all the data. So, when people say they are being "objective", see if they are meeting this type of simple, defined criteria. And, yes, I hear you Gen-X'ers and Millenials: you got it. This is a procedure. And you hate procedures. Really? Do I have to follow a procedure? Well .. let's just say "only if you truly want to see the Elliott Wave at work." Ok, now, for those of you interested in only the modest amount of mathematics, I told you I would tell you the secret of why you need to pick the time-frame that best provides 120 - 160 candles on the chart. Here you go: it is because it takes 5 x 34 = or 170 candles to produce five oscillations around the 34 period moving average of the Elliott Wave Oscillator. Yes, the bright ones among you got it right: the five "oscillations" are the five waves of an Elliott Impulse Wave. So, if you are going to have a chance of seeing that fourth wave come back to the channel with the EWO nearing zero, it must happen starting sometime soon after 120 candles are on the chart. That's all there is to it! It's that simple! Don't make it more complicated than it is! We could, of course, spend a lot of time in this blog wishing everyone well in the new year (and we sincerely do! ), but rather we have some wishes that some Elliott Wave blogs and sites would really tell it like it was - for them! Some were fantastically bullish from 2014 - 2015, setting targets for the S&P500 as high as 2,500+ within that time, only to be sorely disappointed that not only was that level not reached, but even more modest new highs after the May, 2015 high were not reached. Not so for us! We took the approach that an ending diagonal triangle was formed from November, 2014 to May, 2015, and that it meant downside ahead. People wrote to us - told us we were crazy - told us we didn't know how to count an ending diagonal - because the downside wasn't occurring as fast as it 'should' have (clearly in their opinion), until, whoosh, then there was all the downside you could handle in August! What really galls us though, through out the whole affair is the lack of candor some of these sites have had. Even in their "year-end review", they make no mention of how they doggedly posted 1-2-i-ii, up, in full pace with the bullish fervor of the time, did not obtain new highs, and these waves were not followed by the elusive wave 3. We even went to these sites, pleaded with them as best we could to 'look out below', posted numerous charts - only to be ignored until it was too late. In other words, if you were placing investments on a "three to follow" - plain and simple - you lost! They got caught up in bullish sentiment; we did not. Rather our approach cited the "fourth wave conundrum", the whippy trade, and the lack of follow-through. We said it was very possible a triangle was forming for Primary 4, as just one of the many alternates possible in the various wave four structures; OR that Primary 5 was forming, giving probabilities only. We even 'tried' to count five waves up from the August low, but quickly noted on December 19th in this blog when downward overlap occurred, and that count appeared kaput - just someone's pipe dream. So, where are we now? To make life simple : we are still in a range! We are in the range between the August, 2015 low and the May, 2015 high. Until we break out of that range, we can not assign a new Intermediate wave label. We showed you the possible & even probable W-X-Y count, down to a new low in the December 19th post. The reasoning is simple: we think that since the other market averages (DJIA, DJT, RUT) made lower lows in August, 2015, proving out their earlier ending diagonals ending in May, 2015, that the S&P500 should too. Well, how about the current wave structure? As we cited in the December 20th blog post. It is "still" not out of the realm of possibility that the market makes a Primary 4th triangle, but the wave structure still is not indicating that (a slightly higher high over the November 2 high is needed to reactivate that possibility). Instead, we think, most likely we are headed for the new low, wave (Y), shown in the December 19th post, and as evidence, we are counting this structure below on the four hourly chart of the cash S&P 500. In this chart the blue numerals are the number of S&P points traveled. As you can see, the structure currently is Wave minute iii (circle iii) is 112 points, and it is longer than minute i (circle i) at 97 points. And wave minute iv (circle iv) at 88 points is longer than wave minute ii (circle ii) at 85 points. Wave minute iv also overlaps wave minute i, so the only thing that would be needed is for wave minute v (circle v) to become longer than wave i. If this occurs, and a proper Expanding Leading Diagonal is formed, then it would be minor wave A, of Intermediate (Y). This would be a 3:3:3:3:3 form of a Leading Diagonal and would NOT be as bearish as the 5:3:5:3:5 variety - meaning it may not be a final top. But, it could be bearish enough to form minor A-B-C down to Intermediate wave (Y). Will it occur? Well sometimes the first trading day of the new month and new year can have some fireworks in it from the new inflows from pension plans, 401k plans, etc. So, it is even 'possible' that wave minute iv (circle-iv) is not done to the upside yet. 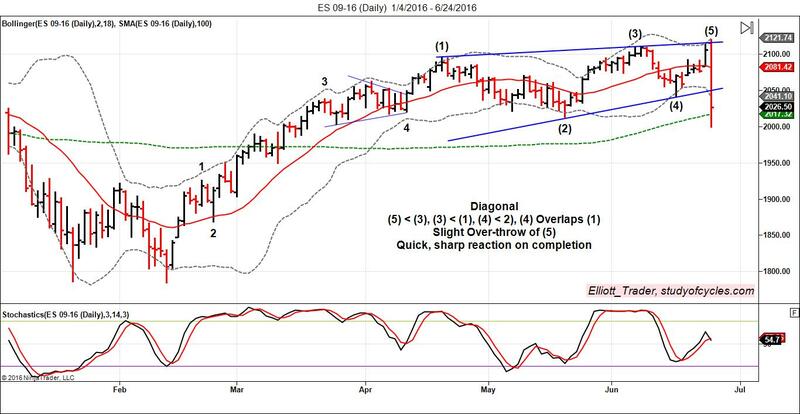 Thursday's down move 'could' only be wave iv of the minuet (c) wave higher of minute iv. That would not change anything as long as the high of wave minute ii (circle ii) was not exceeded at 2104.27 on the cash S&P. Barring that, wave minute v (circle v) should become longer than minute iii (circle iii) at 1970.55, and this would be the level to exceed lower once the end of minute wave iv (circle iv) is confirmed.